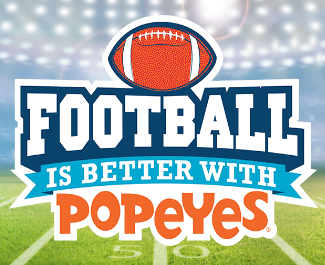 Football is Better with Popeyes® Sweepstakes & IWG – Win a trip to the Bahamas! Win a trip to the Bahamas (2 winners)! ENTER SWEEPSTAKES HERE – Popeyes Sweepstakes page. ENTRY LIMIT – Limit: Each entrant may receive 1 Instant Win Game play per day during Phase 1. Limit: You may receive 3 Points into the applicable Sweepstakes drawings per day during Phase 1 for making selecting your Pick of the Week. ELIGIBILITY – Football is Better with Popeyes® is open only to legal residents of the 50 United States (or D.C.) who are 18 years of age or older at the time of entry. SWEEPSTAKES ENTRY PERIOD – The Promotion begins at 12:00 a.m. Eastern Time (“ET”), November 25, 2016 and ends at 11:59 p.m. ET, February 5, 2017. PRIZES – 2 PHASE 1 GRAND PRIZES: A trip for 4 to Nassau, Bahamas. Trip package includes roundtrip coach-class air transportation from an airport near winner’s home (determined by Sponsor in its sole discretion) to Nassau, Bahamas; 4 nights’ accommodations for 4 (single room, quad occupancy) at a hotel determined by Sponsor; ground transportation between airport and hotel; and $500 spending money. Approximate Retail Value (“ARV”): $5,000. 1 PHASE 2 GRAND PRIZE: A Football is Better with Popeyes® Prize Pack including a customized tailgate golf cart, a $500 gift card that can be used to purchase Popeyes® (terms and conditions apply); a Yeti® Cooler; and 4 Yeti® tumblers. Sponsor will determine all features of golf cart including but not limited to color of exterior and interior, and all other features or upgrades will be allowed only if permitted by delivery dealer and paid for by winner. Winner must be a licensed driver. ARV: $20,000. 10 WEEKLY PRIZES (1 per Weekly Entry Period): A $500 gift card that can be used to purchase Popeyes®, a Yeti® cooler and a Yeti® Rambler Tumbler. ARV: $800. 10 FIRST PRIZES (Awarded during Phase 2): Yeti® Cooler. ARV: $278. 10 SECOND PRIZES (Awarded during Phase 2): Yeti® Tumbler. ARV: $60. 800 THIRD PRIZES (300 for Phase 1 and 500 for Phase 2): A $10 digital Fanatics® Gift Code. ARV: $10. Sponsor and Administrator are not responsible for complaints or issues regarding digital codes/certificates (claims that digital code/certificate is invalid, insufficient, etc.) and winner should address any such issues with the issuer of the digitalcode/certificate. SmartSource New Year, New You! 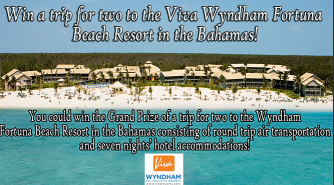 Sweepstakes – Win a trip to the Bahamas! ENTER SWEEPSTAKES HERE – Smart Source Sweepstakes page. ENTRY LIMIT – Limit one (1) Entry per person or email address per day regardless of Entry method. ELIGIBILITY – Sweepstakes open only to legal residents of the forty-eight (48) contiguous United States and the District of Columbia, who are 21 years of age or older on the date of entry. SWEEPSTAKES ENTRY PERIOD – You may enter the sweepstakes between 12:01 AM Eastern Standard Time (“EST”) on 1/3/16 and 11:59:59 PM EST on 2/29/16. PRIZES – ONE (1) GRAND PRIZE: One (1) winner will receive one (1) trip for Grand Prize Winner and one (1) Guest to the Freeport, Bahamas consisting of: round trip economy class air transportation for two (2) persons from the major commercial airport with regularly scheduled flights nearest winner’s permanent residence at the time of entry to Freeport International Airport, seven (7) nights hotel accommodations (one double occupancy hotel room) at the Wyndham Fortuna Beach Resort and on-premise meals and non-alcoholic beverages daily. The approximate retail value (“ARV”) of Grand Prize up to: $4,926. Peanut Butter & Co. 25 Days of Holiday Surprises Sweepstakes – Win a trip to the Bahamas! Win a trip for 4 to the Bahamas! ENTER SWEEPSTAKES HERE – Peanut Butter & Co. Sweepstakes page. ELIGIBILITY – Sweepstakes is open only to legal residents of the fifty (50) United States, including the District of Columbia, who are twenty-one (21) years of age or older at the time of entry. SWEEPSTAKES ENTRY PERIOD – The 25 Days of Holiday Surprises Sweepstakes begins at 12:00:00 a.m. Eastern Time (“ET”) on December 1, 2015 and ends at 11:59:59 p.m. ET on December 25, 2015. PRIZES – GRAND PRIZE: The Grand Prize trip courtesy of Funjet Vacations consists of: a) round trip air transportation for winner and up to three (3) guests from a major commercial airport in the 50 United States nearest to winner’s primary residence to the Bahamas; b) round trip ground transportation between airport and resort; and c) 4-night double-occupancy hotel accommodations [up to two (2) rooms and room tax only] at Memories Grand Bahama Beach Resort & Casino. Winner and guest(s) are responsible for the airline taxes and fees which cost $150 per person (non-refundable). The ARV for the trip must not exceed $5,000.00. Dr Pepper Popeyes Football Sweepstakes & IWG – Win a trip to the Bahamas & more! Win either a trip for two (2) to Nassau, Bahamas to attend the 2015 Bahamas Bowl® or the 2016 Bahamas Bowl & more! ELIGIBILITY – Dr Pepper Popeyes Football Promotion consists of a sweepstakes and an instant win game. The Promotion is open only to legal residents of the fifty (50) United States and the District of Columbia who are at least eighteen (18) years old at the time of entry. SWEEPSTAKES ENTRY PERIOD – The Promotion begins on August 25, 2015 at 12:00 a.m. Eastern Time (“ET”) and ends on October 25, 2015 at 11:59 p.m. ET. PRIZES – Sweepstakes Prizes: ONE (1) GRAND PRIZE: Winner’s choice of either a trip for two (2) to Nassau, Bahamas to attend the 2015 Bahamas Bowl® or the 2016 Bahamas Bowl®. Trip package includes round trip, coach-class air transportation for two (2) from a major airport near winner’s home (determined by Sponsor in its sole discretion) to Nassau, Bahamas; four (4) nights’ accommodations at a hotel determined by Sponsor in its sole discretion (single room, double occupancy); ground transportation to and from destination airport and hotel; two (2) tickets to either the 2015 or 2016 Bahamas Bowl®; one (1) day water park entrance for two (2); ultimate dolphin trainer for a day for two (2); rum runners tour for two (2); swag package in winner’s choice of team (swag determined by Sponsor in its sole discretion); a $3,500 check that can be used for taxes; $500 spending money; and travel agent services. Approximate Retail Value (“ARV”): $16,000. Winner must travel on the dates determined by Sponsor in its sole discretion or prize will be forfeited. ONE (1) FIRST PRIZE: An indoor theatre prize pack. Prize pack includes a 50” smart flat screen, a sound system (includes a sound bar and sub-woofer), a video game system, and a universal remote. ARV: $2,049. ONE (1) SECOND PRIZE: An outdoor theatre prize pack. Prize pack includes an outdoor projector, external speakers, a cooler, a wireless HDMI transmitter, and a screen. ARV: $2,009. Instant Win Game Prizes: SIXTY-TWO (62) THIRD PRIZES: A $500 Fanatics.com digital gift card. ARV: $500. ONE HUNDRED TWENTY-FOUR (124) FOURTH PRIZES: A $250 Fanatics.com digital gift card. ARV: $250. ONE HUNDRED TWENTY-FOUR (124) FIFTH PRIZES: A $100 Fanatics.com digital gift card. ARV: $100. ONE HUNDRED TWENTY-FOUR (124) SIXTH PRIZES: A $50 Fanatics.com digital gift card. ARV: $50. ONE HUNDRED TWENTY-FOUR (124) SEVENTH PRIZES: A $25 Fanatics.com digital gift card. ARV: $25. SIXTY-TWO (62) EIGHTH PRIZES: A $10 Popeyes gift check. ARV: $10. 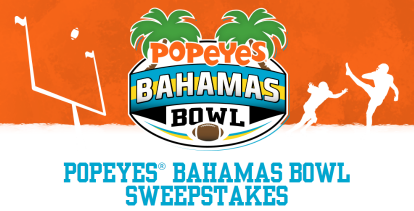 Popeyes Bahamas Bowl Sweepstakes & IWG – Win a trip to the Bahamas! Win a trip for 4 to the Bahamas & $1,000 (4 winners)! ENTRY LIMIT – Limit: Each entrant may receive one (1) Sweepstakes entry by any method or combination of methods of entry per calendar week (a week beginning on every Monday and ending on every Sunday) of the Promotion Period and each entrant may receive one (1) Instant Win Game play per day by any method or combination of methods of entry during the Promotion Period. ELIGIBILITY – Popeyes Bahamas Bowl Sweepstakes is open only to legal residents of the fifty (50) United States (including District of Columbia) who are at least eighteen (18) years old at the time of entry. SWEEPSTAKES PERIOD – The Promotion begins on December 1, 2014 at 12:00 a.m. Eastern Time (“ET”) and ends on January 15, 2015 at 11:59 p.m. ET. PRIZES – Sweepstakes Prizes: FOUR (4) GRAND PRIZES (two (2) awarded per Entry Period): A trip for four (4) to the Bahamas. Trip package includes round trip, coach-class air transportation for four (4) from a major airport near winner’s home (determined by Sponsor in its sole discretion) to the Bahamas; four (4) nights’ accommodations (single room, quad occupancy or two rooms, double occupancy, hotel determined by Sponsor in its sole discretion); ground transportation to and from destination airport and hotel; $1,000 spending money; and travel agent services. Winner must complete the trip within one (1) year from the drawing date or prize will be forfeited. Trip must be booked at least twenty-one (21) days prior to departure. Approximate Retail Value (“ARV”): $6,500. Instant Win Game Prizes: ONE HUNDRED (100) FIRST PRIZES: A Popeyes Bahamas Bowl hat. ARV: $20. 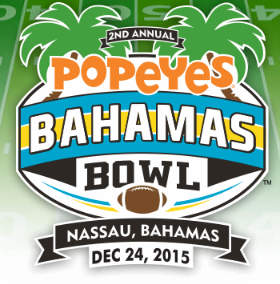 ONE HUNDRED (100) SECOND PRIZES: A Popeyes Bahamas Bowl t-shirt (size determined by Sponsor in its sole discretion). ARV: $15. ONE HUNDRED (100) THIRD PRIZES: A $10 Popeyes gift card (terms and conditions of gift card apply). ARV: $10. Bahama Breeze Rumtoberfest Sweepstakes & IWG – Win a trip to the Bahamas! Win a trip for two to the Bahamas! ENTER SWEEPSTAKES HERE – Bahama Breeze Sweepstakes page. ENTRY LIMIT – Limit: Each entrant may enter/play one (1) time per day during the Promotion Period. Multiple entrants are not permitted to share the same email address. ELIGIBILITY – Rumtoberfest Sweepstakes and Instant Win Game is open only to legal residents of the fifty (50) United States (and D.C.) who are at least twenty one (21) years old at the time of entry. SWEEPSTAKES PERIOD – The Promotion begins on September 22, 2014 at 12:00 a.m. Eastern Time (“ET”) and ends on November 2, 2014 at 11:59 p.m. ET. PRIZES – Sweepstakes Prize: ONE (1) GRAND PRIZE: A trip for two (2) to the Super-Inclusive® Breezes Resort & Spa in the Bahamas. Trip package includes round trip, coach-class air transportation for two (2) from a major airport near winner’s home (determined by Sponsor in its sole discretion) to Nassau, Bahamas; five (5) nights’ accommodations at the Super-Inclusive® Breezes Resort & Spa in the Bahamas (single room, double occupancy); ground transportation to and from destination airport and hotel; $1,635 towards taxes associated with the prize; and travel agent services. Winner must complete the trip within one (1) year from the drawing date or prize will be forfeited. Trip must be booked at least twenty-one (21) days prior to departure. Approximate Retail Value (“ARV”): $7,085. Instant Win Game Prizes: FORTY TWO (42) FIRST PRIZES: A $25 Bahama Breeze gift card. Terms and conditions of gift cards apply. ARV: $25. FORTY TWO (42) SECOND PRIZES: A Bahama Breeze t-shirt. Sponsor will attempt to accommodate but size of t-shirt shall be determined by Sponsor in its sole discretion. ARV: $15.